First we discuss the interlinked problems of climate change, peak fossil fuels and the credit crunch and then grounds for some optimism, including means of adjusting energy and commodity markets to start to address these ills, and other measures to deal with non-CO2 greenhouse gas emissions. The world has warmed by approximately 0.7 degrees Celsius in the 200 years since fossil fuels began to be used on any significant scale. The rate at which the planet is heating up could be accelerating and 2010 was the hottest year since the global record began, 131 years ago. All ten of the warmest years on record have occurred since 1998. The warming has not been uniform. The biggest temperature rises have been around the North Pole where some worrying self-reinforcing feedbacks have developed. For example, the Arctic ice has been melting unexpectedly rapidly. In December 2010 Arctic sea-ice cover was the lowest ever recorded, with an average extent over the month of 12 million square kilometres, 1.35 million square kilometres below the 1979-2000 average for December. In 2011 the September Arctic sea-ice cover was the second lowest recorded. The melt could be increasing the rate at which the planet heats up because the white ice which reflected solar energy back into space has been replaced by dark, heat-absorbing sea. Similarly, the warming is melting the permafrost in Russia and releasing large amounts of methane, a powerful greenhouse gas, into the atmosphere. 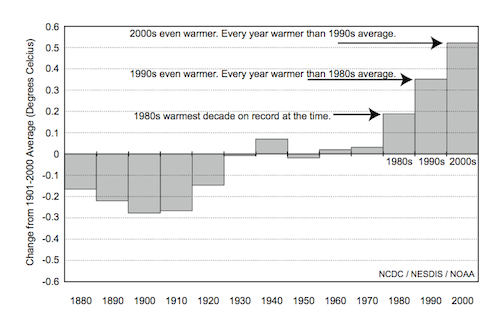 How the world’s average temperature has changed from decade to decade. The rate of increase in the last three decades has been extremely rapid. Even if the atmospheric concentration of greenhouse gases was to be stabilised at its current level, the Earth would continue to warm by at least another 0.7 degrees. This is because the full heating effect of these gases takes some years to overcome the Earth’s considerable thermal inertia. This extra warming would obviously melt more ice, release more methane and accentuate other feed-backs as well. The public debate about what should be done to stem the warming has focussed on just one greenhouse gas from just one source – carbon dioxide emissions from fossil fuel use. However, there is only the remotest possibility that the international community will take effective action through the existing United Nations’ mechanisms to reduce fossil fuel CO2 emissions in the limited time left before the feedbacks become self-reinforcing and generate a rapid, unstoppable and disastrous shift to a very much warmer climate. This is because reducing the amount of CO2 released from the burning of fossil fuel can be achieved in only three ways. One is to burn less fossil fuel but this reduces the amount of energy the economy has available which in turn tends to reduce people’s incomes. As no society wants its incomes to fall, a lot of effort has been put into burning fuel with increased efficiency and into developing non-fossil energy sources to try to break the historically-close link between income and fossil-fuel use. So far, however, only a limited number of countries have managed to continue to grow their economies while reducing their fossil fuel use. Sweden is one. 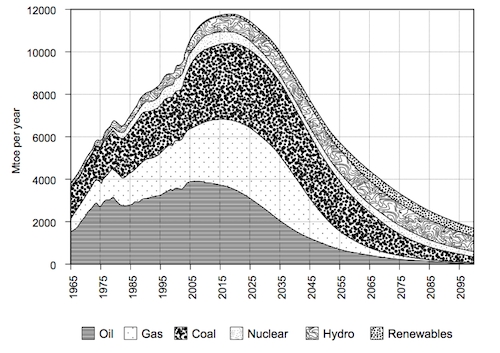 It reduced fossil fuel’s contribution to its total energy supply from around 80% in the early 1970s to about a third today by increasing its production of nuclear (just under half its electricity comes from nuclear plants) and renewable energy while at the same time stabilising the amount of energy used per head of population. It also increased the efficiency with which it used energy, reducing the amount required to produce $1,000-worth of output by a third. Unfortunately, however, the Swedish model cannot be applied to more than a handful of countries. Nuclear energy is not fossil-fuel free and a long time is required for a reactor to recoup the energy input and CO2 emissions incurred in construction. This means that reactors cannot be built fast enough on a world scale to cut CO2 emissions at the rate dictated by the latest climate science. Moreover, even if it made sense to temporarily boost CO2 emissions and drastically reduce the supply of energy and capital to the rest of the global economy to allow the plants to be built, there would be insufficient high grade uranium ores to run them and mining what little there is would be fossil-energy intensive. Thorium is being touted as a more-abundant alternative to uranium but its use has not yet been demonstrated in a commercial reactor and by the time one is built, the time left for decisive climate actions to halt the feedbacks may well have run out. Nor is producing plutonium in fast breeder reactors a solution to the uranium supply problem. The required reprocessing of fuel to separate plutonium, uranium and fission products is not cost effective without hefty subsidies from nuclear weapons programs. Moreover, the large scale plutonium economy needed for a world-wide fast reactor programme brings with it severe risks from nuclear proliferation and all forms of nuclear terrorism. Renewable energy sources will not enable us to make massive emissions cuts either as they also take time and require a lot of fossil energy to develop on the required scale. Because we have left making the transition to renewable energy so late, using a lot less fossil fuel would mean that less energy would be available in total and that, as a result, incomes would be lower than today’s for the foreseeable future. Governments are reluctant to accept this, of course, and have been hoping that an alternative way being proposed to reduce fossil carbon emissions will enable their countries to continue to burn fossil fuels with a clear conscience on a scale not too much less than their current one. This involves capturing the carbon dioxide produced when the fuel is burned and locking it safely away for many thousands of years, perhaps by pumping it into disused gas wells. Unfortunately, the process requires a lot of energy itself and thus increases the demand for fossil fuels. Paul Chefurka’s estimates indicate that the total amount of energy available to the world will begin to fall about 2020 and could be half the maximum level thirty years later. This is because supplies of nuclear, hydro and renewable energy cannot be developed fast enough to make up for the rate at which fossil output declines. These themselves will be in short supply. The world’s supply of oil has been flat since 2004 because the producers have been unable to bring new sources on line faster than the output from their older fields has declined. Their inability arose because oil is getting harder to find and extract – BP would not have attempted to open its disastrous well 1,600 metres below the surface of the Gulf of Mexico if it had had any better options. The increasing production difficulties mean that the supply of oil will soon begin to decline and that, year by year, the decline will be at an accelerating pace. Although the output of coal and gas is still increasing, their supply will begin to contract too in a few years’ time. A Canadian analyst, Paul Chefurka, expects coal output to reach its peak in about five years and conventional natural gas in about 15. He omits shale gas supplies from his projection as the extent of its future is very unclear, as we will see. For the reasons we just noted, he does not expect the supply of renewable and nuclear energy to expand fast enough to compensate for the decline in these fuels and, as a result, he believes that humanity’s total energy supply from all sources will begin to decline after 2020. The decline he expects is shown in Illustration 2, which also indicates that he believes there will be very little growth in the overall energy supply before the decline begins. This implies very little increase in world incomes over the next decade. One reason for this earlier peak could be that the Energy Return on the Energy Invested (EROEI) in developing new coal mines and the infrastructure required to get the coal to where it will be burned is very low. A study carried out by Jamie Bull, a sustainability consultant based in London, puts it at 5.5. In other words, if you invest one unit of energy in developing a coal mine and its infrastructure, you get 5.5 times that energy back over the mine’s life. That might seem a good return but in fact it is not. New oil fields are giving perhaps three times that return – and, when easy oil was available, as it was in Texas in the 1930s, they had EROEIs of around 100 – that is, 18-20 times better. You might think that it would be worth producing coal for energy use so long as the return was better than 1 for 1 as this would give you back slightly more energy from the coal than it took you to extract it. However, if that return applied to all a country’s energy sources it would mean that the economy devoted almost all its efforts to getting its energy and had almost no energy left for doing anything else. Professor Charles Hall of New York State University, who developed the EROEI idea after investigating why fish used energy to migrate, believes that, in view of the amount of energy it takes to run our civilisation, its energy sources need an average return significantly higher than 3:1 for it to persist. If this is correct, it means that new coal production is already a marginal energy source for our society and its output might decline very quickly particularly as the return on other forms of energy investment are much better. Hall calculates that wind power has an EROEI of 25 and, in places where there is a big difference between high and low tide, barrages can give back 115 times more energy over their life than they take to build. By contrast, if the carbon dioxide from burning coal has to be sequestered by compressing it and pumping it into a disused gas well, he calculates that only 1.5 times the invested energy comes back. This is far too little for carbon capture and storage (CCS) to be a commercial possibility. Utilities are beginning to recognize that coal is not a viable long-term option. TVA [mining corporation] announced in August 2010 that it was planning to close 9 of its 59 coal-generating units. Duke Energy, another major south eastern utility, followed with an announcement that it was considering the closure of seven coal-fired units in North and South Carolina alone. Progress Energy, also in the Carolinas, is planning to close 11 units at four sites. In Pennsylvania, Exelon Power is preparing to close four coal units at two sites. Xcel Energy, the dominant utility in Colorado, announced it was closing seven coal units. And in April 2011, TVA agreed to close another 9 units as part of a legal settlement with [the] EPA [Environmental Protection Agency]. In an analysis of the future of coal, Wood Mackenzie, a leading energy consulting and research firm, describes these closings as a harbinger of things to come for the coal industry. The situation with gas is harder to read. The rate at which global gas fields were being discovered peaked around 1970 and has declined so sharply since with the result that consumption has outpaced discovery since 1980. This would lead one to predict that production would peak soon and that the rate at which output declined would be even faster than for oil as this is characteristic of individual gas well depletion. But the development of shale gas supplies invalidates this prediction. Shale gas is produced by blasting a cocktail of chemicals and other materials into gas-containing rock to shatter it into myriads of pieces. The cracks this creates allow the gas to be pumped out. Environmental groups and the US Environmental Protection Agency are worried about the effects that this fracturing and the chemicals used will have on drinking water supplies and on the environment generally. Very large volumes of water are pumped down the well during fracking and, even if no noxious chemicals are added to it, when it comes back to the surface it could be heavily contaminated with arsenic and other heavy metals which have leached out of the shattered rocks though which it passed. A slurry of rock fragments is discharged, too. Both the slurry and the liquid need to be disposed of safely. This is expensive so the conventional approach is just to run it into a lagoon with the promise of remediation later on. As a result of these concerns, New York State has imposed a moratorium on drilling while New Jersey has banned it permanently. So has France. Bans have also been imposed in parts of South Africa and Australia. The industry, however, denies that groundwater supplies are being polluted because the fracturing occurs far below the level from which the water is extracted. From a climate point of view, the process also looks unpromising because some of the gas, which is mainly methane, a very powerful greenhouse gas, escapes into the atmosphere. As a result, a Cornell professor, Robert W. Howarth, estimates that that shale gas may be slightly worse for the climate than coal. Tom Wigley of the US National Center for Atmospheric Research, Boulder has recently confirmed Howarth’s finding. If the warming effect of methane at 20 years is taken to be 72 times that of CO2  and Howarth’s upper bound figure of 7.9%  for the percentage leakage of methane during north American shale gas production is right, it is easy to calculate the warming effect of the methane is about twice as great as that of the CO2 produced by burning the shale gas without carbon capture and storage. Shales suited to fracking are found all over the world and a lot of gas could be produced from them provided that the environmental objections can be overcome and the EROEI is sufficiently high for the process to compete with renewable energy technologies. So far, however, the EROEI figure does not look good – it could be 4 or 5 – because the amount of gas released by the fracturing starts to decline quickly after a well is opened, giving each well a relatively short useful life. A well can be re-fracked up to five times after its first decline, perhaps every four to five years for successful wells but it is not clear how fast production will decline after each re-fracking. As a result, it will be some time before the EROEI of the whole cycle is known from sinking the well to reaching the consumers. Early financial returns may look so promising that investors pile in but the long-term energy return may disappoint. Nevertheless, taking oil, coal and gas together, we know enough to conclude that emissions from fossil energy are going to fall anyway without any international agreement and people’s incomes will fall with them. The trick that governments need to pull off is to manage the income decline so that a catastrophic economic collapse is avoided. To do this they need to understand why the world economy almost collapsed after the Lehman Brothers bank failed in 2008. Because the supply of oil had not increased since 2004, its price went up and up in the period before the bank failed, as demand for it grew, taking the prices of gas, coal, food and other commodities with it. These increasing prices for energy and commodities meant that more and more money had to leave the net importing countries to pay for these imports. A lot of the money spent this way was not returned in the form in which it left, to the countries that spent it. It went out as income and came back as capital. I’ll explain. If I buy petrol for my car and part of the price goes to Saudi Arabia, I can only buy petrol again year after year if that money is returned year after year to the economy from which my income comes. This can happen in two ways, one of which is sustainable, the other not. The sustainable way is that the Saudis buy goods and services from the country in which I live or from countries from which my country imports less than it exports. If the Saudis do this, the money returns to my country as income. The unsustainable way is that the Saudis lend it back to my country. This returns it as capital. The loan enables my country to continue buying oil, but only by getting deeper and deeper into debt which will eventually need to be repaid. As commodity prices rose in the years before 2008, the flow of money to the energy and mineral producers increased so much that there was no way that the countries concerned could spend it all back into circulation. They lent it back instead and eventually the level of debt in the consumer countries became too great to be borne. In the US, as people sought to maintain and improve their lifestyles by borrowing, the ratio of household debt to household income grew by more than 40% to around 130% between 1997 and 2007. In Britain, the ratio rose by over 50% to a similar 130% and Ireland outdid both US and UK, increasing its ratio by 85% to a massive 190%. The weakest US borrowers, those with sub-prime mortgages, were the first to be unable to pay and, because of the way their loans had been “securitised” and sold off around the world, no-one knew which banks were nursing securities which had lost most of their value. The consumer countries’ banks lost faith in each other and, had governments not stepped in with bailouts and guarantees, many would have collapsed. So the fundamental reason for the “credit crunch” and the over-indebtedness of the consumer countries was that the commodity suppliers could not expand their output because, for example, oil was getting harder and harder to find and production in many fields declining, and this enabled them to put their prices up to such an extent that their customers’ economies eventually collapsed. Until the role of energy supply constraints is recognised and corrected, the global economy will never function well again because the moment that the “green shoots of recovery” appear in the consumer countries and spending begins to rise, their demand for energy will go up. It will quickly exceed the available supply and the price they have to pay for it will soar. The money they use to pay the higher prices will not be available for domestic spending. As a result, the green shoots will wither unless the energy exporters return all their increased income by purchasing goods and services from their customer-countries. If the energy exporters save at all, (and they will want to, because they know that they are exploiting a depleting resource) they will risk undermining the attempted recovery, the value of their investments in their customers’ economies falls as the recovery falters, as does their own income stream as prices fall back. Correcting the way the energy market works is therefore in the interests of both buyers and sellers. The required correction involves sharing out what economists call the “scarcity rent” – the extra over and above production costs that producers are able to charge when something gets scarce. At present, all the scarcity rent is kept by the producers with the result that debt and income-distribution problems build up. The sharing must therefore involve limiting the amount of rent the producers receive, and distributing the remainder in a way that ensures their customers can keep consuming. It would agree with the fossil energy producers how much coal, conventional and unconventional oil, and gas from any source they would supply at a fixed price each year for the next five years. The agreed price would probably rise in successive five year periods in real terms as output fell. In return, the producers would undertake only to supply fuel to buyers with purchase permits from the cartel. Each month, the cartel would auction permits, with separate permits entitling the purchaser to buy specific quantities of one of the three fuels. Provided the global economy was buoyant enough for fuel demand to exceed the production level agreed with the producers, the price that bidders offered for permits would be above zero and the cartel would earn an income, very probably a large one, from their sale. The permit income would then be shared amongst all the members of the cartel on a previously-agreed basis. These arrangements would have much in common with the Feasta Climate Group’s proposals for Cap and Share. Such a scheme would keep as income most of the income used to buy energy – only the savings that the energy producers were able to make out of their guaranteed incomes would become capital, a lot of which would be likely to be spent on construction projects in consumer countries, converting capital straight back to income again. The advantages of the arrangement would be enormous. The cartel’s guarantee of high and rising real prices would give the producers a better return from keeping their oil, gas and coal in the ground than they could be sure of getting if they extracted them and invested the proceeds on Wall Street. The avoidance of oil and other energy price spikes would help to stabilise the global economy. Although the total price of energy including the cost of the permit would still be set by the market, renewable energy producers would be able to invest with confidence as they would know what the base price of fossil energy was going to be for five years ahead. The fossil fuel energy market itself would be buoyant and stable because the investment in renewable energy would boost the economy, paradoxically encouraging an increased demand for fossil fuels at least in the early cycles before the production of renewable energy took off. How would the cartel’s version of Cap and Share differ from the Feasta Climate Group’s version? In the Feasta version, the international community would set up a special agency – let’s call it the Global Climate Trust – to handle CO2 emissions. Taking the best scientific advice, the Trust would decide on the rate at which emissions from fuel use needed to fall year by year to prevent the climate feedbacks from becoming uncontrollable. Many climate stabilisation proposals produced in line with the latest science envisage cutting fossil fuel CO2 emissions by between 80% and 100% by 2050, and if this was the reduction the Trust adopted, an annual roll-back rate of around 6% would be required. At that rate, emissions would be reduced by a third after seven years, by a half after twelve, by two-thirds after 19 and would be down to 10% of their present level by 2050. The cartel, on the other hand, would not impose for climate reasons an annually-declining cap on the amount of fossil energy it agreed to buy from the producers. Its limit would be set by what the producers contracted to supply at the negotiated price. But this difference might not matter very much because the rate at which oil production is likely to decline as a result of production constraints could be at around the 6% rate anyway. Indeed, the IEA reported in 2008 that production from 600 existing fields was already declining at 6.7% a year, far more than the 3.7% decline it had estimated in 2007. However the IEA World Energy Outlook 2010 considered that the decline in crude oil production from existing wells will be more than compensated for by increased production of crude from reserves yet to be exploited and reserves yet to be discovered together with increases in natural gas liquids and other types of unconventional oil and that total oil production will continue to rise to 2035. In contrast, most recent reports on future oil supplies such as that published by the British Government-funded Energy Research Centre in October 2009 and by Kjell Aleklett’s group have presented strong evidence that the IEA’s analysis is badly flawed, concluding instead that total world oil output will peak by 2020. But while emissions from producing and burning conventional oil, coal and conventional natural gas output might decline under the cartel arrangement at about the rate the Feasta Global Climate Trust might require, there are three reasons why this may not be fast enough to prevent dangerous global warming. We have dealt with one – shale gas production. The other two are the possible massive development of the Canadian tar sands possibly using steam produced directly by nuclear reactors to melt the tar; and the underground gasification of coal. The latter involves drilling two boreholes into a coal seam and linking them, either by drilling horizontally or by fracking, exactly as with the shale gas. Air and/or steam is passed down one hole, the coal is set alight and the gases from its controlled, partial combustion emerge from the second hole. They consist of hydrogen (especially if steam is injected as in the conventional production of water gas), carbon dioxide, carbon monoxide, methane, and small quantities of ammonia, oxides of nitrogen and, depending on the sulphur content of the coal, hydrogen sulphide. The latter has to be removed but the rest of the gas can be burned directly in a gas-fired power station, which, it is claimed, could be fitted with carbon capture equipment so that the CO2 in the exhaust fumes could be pumped back into the coal seam from which the carbon came after the burning operation has moved on. If this sequestration was actually done – and doing so would obviously involve extra costs – there would still be two serious environmental drawbacks. One is subsidence– when the coal is burned out, the rocks above collapse and the land sinks, causing structural damage to buildings on the surface. This is a well-known problem in conventional coal-mining areas and mines would frequently avoid digging coal from under important buildings to avoid having to pay substantial sums in compensation to their owners. The other threat is to aquifers which can become polluted by the carcinogenic tars left by the burning coal, particularly as the rock strata around the burn break up. Underground coal gasification has been used in the past but most projects seem to have been abandoned because low gas and oil prices made them uneconomic. However, higher energy prices in future are likely to lead to a massive resurgence, particularly if environmental controls are lax. Thus the large size of coal, shale oil , shale gas and tar sand reserves and the ease with which these can be exploited by the methods outlined above have potentially grave consequences for atmospheric CO2 levels and temperature rises . It follows that there is no guarantee that reductions in the supply of fossil fuels from conventional sources as a result of resource constraints will directly prevent catastrophic temperature rises. It is therefore important that, if an energy-consumers’ cartel is established, it has climate change goals. This is potentially not a problem because the cartel would be set up by governments rather than short-run profit-maximising multi-national corporations. However, it is unlikely that climate goals will be built into the cartel’s constitution unless there is strong pressure from the electorate to do so. The low probability at present that this pressure will be forthcoming is a flaw in this approach. Compensation payments for higher energy prices. 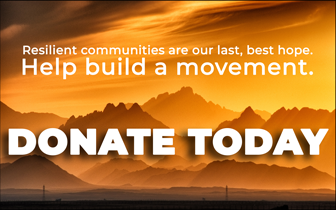 A Hardship Fund for communities particularly hard hit by the effects of climate change or the transition to non-carbon energy. Investment capital for renewable energy development. The operating costs of the Global Climate Trust itself. I will comment on the first four in turn and then we will see whether the cartel might need to do much the same. Compensation payments. Fossil fuel producers will have to pass on the cost of the permits they buy to their customers. As the supply of permits gets increasingly tight, their price, and thus the price of energy will go up, taking the price of food and other necessities with it. People will have to be compensated individually for these rises at some basic level as, otherwise, the poor would be driven out of the market and go cold and hungry. However, the basic compensation can never be enough to cover the increase in the cost of living of people whose lifestyle involves the direct or indirect use of a lot of energy. This group, which is made up of richer people in every country, will inevitably find that their cost of living goes up by more than their compensatory payment. The Carbon Maintenance Fee. The higher energy prices will put extra pressure on the world’s forests and pasture land. Unless these were protected they would be opened up for biofuel production and massive amounts of carbon dioxide would be released and other ecosystems services badly damaged as a result of the land-use change. This is already happening in Indonesia where it is reckoned that when jungle growing on peatland is cleared for palm oil production, the amount of CO2 released is so great that it could take over a century for it to be recovered by burning the palm oil instead of diesel fuel. The payment of a Carbon Maintenance Fee (CMF) to reward countries which maintain the amount of carbon locked up in their soils and bogs and in the plants growing on them is therefore an essential part of any method of limiting fossil fuel CO2 emissions. Under the CMF arrangements, a small sum would be paid annually for each tonne the country concerned had kept intact, the latter determined as a proxy based on the numbers of hectares of each particular land use type. The payment would cover the opportunity cost the country was carrying by refraining from putting the land involved to a more profitable use. However, if the tonnage being safeguarded fell, the country responsible would have to buy special emissions permits to cover the amount of carbon involved. On the other hand, if a country increased the amount of carbon sequestered in its biomass and soils, it would get the special permit price for every tonne. I will discuss the Carbon Maintenance Fee scheme in more detail later on. The Hardship Fund. People in some parts of the world will be especially hard hit by the effects of climate change – those in Bangladesh or the Maldives threatened by rising sea levels, for example. Other communities may need to make exceptional adjustments to cope with much lower levels of fossil fuel use. All countries, rich and poor, would be able to claim both types of assistance from this fund. Assessing these claims and allocating funds fairly would be possible but not easy. Energy investment. There will be calls for a lot of the Trust’s annual income to be used to fund the development of non-carbon energy sources and an international fund is likely to be set up to make loans to multinational projects such as those involved in the development of concentrated solar power in the Sahara, and to national governments for their own investment in energy projects. However, it is important that communities and families can make energy investments too and part of the Trust’s income should be allocated for this purpose. The Trust would almost certainly pay part of the money it collected each year from the sale of permits on an equal per capita basis to everyone on the planet to compensate for higher energy and food costs (see 1. Above). Most of the remainder would go to governments under the Carbon Maintenance Fee, Hardship Fund and Energy Investment headings. The residue would be retained to finance the Trust’s operations which would include programmes to deal with the non-CO2 contributors to the warming effect I will mention later on. There would be pressures for the cartel to spend its auction receipts in a similar way. For example, the governments of the poorer countries in the cartel would insist that part of the money came to them on a population-related basis because they needed to deal with the increase in fuel-poverty that the scheme would inevitably bring about. Some money would probably be used to pay a Carbon Maintenance Fee, some would go to a hardship fund and the remainder might be placed in a revolving loan fund to finance projects to reduce fossil energy requirements against the day they ran out. However, the big, important difference between the Trust’s distribution and that by the cartel is that much more of the Trust’s money would go directly to people whereas the cartel’s would go to its member governments and it would be left up to them to decide how much of it they passed on to their citizens to spend. This difference arises because the Feasta Climate Group regards the right to a share of the benefits of using fossil fuel as a human right, one that belongs to each individual, rather than a national right. As a result, a very high proportion of the Trust’s income from permit sales would go to families and, since collective action on energy can be more effective than family-level action, to the communities in which they live. Governments, however, are unlikely to see things this way. They believe that they can make better decisions than those that emerge from the “wisdom of crowds” and they would want to maximise their control over the cartel money. It is therefore important that a Trust is established to promote the true Cap and Share before, say, the G-20 governments begin to discuss an ersatz version which pays out solely to governments and which has no inbuilt climate objectives, being largely concerned with getting the global economy working again. If fossil carbon dioxide emissions are going to fall rapidly as a consequence of the introduction of a cap (and they would fall even more quickly but with terrible human consequences if the world economy collapsed because something akin to Cap and Share was not introduced) those concerned about the climate can move on to deal with other aspects of the crisis. This will be both productive and liberating. It is not generally recognised that the fossil CO2 we’ve been so bothered about may have contributed as little as between 7 and 20% to recent warming if the feedback effects of water vapour, itself a greenhouse gas, are included. However, as there is a lot of uncertainty about the role played by water vapour, it is usually ignored, particularly as its concentration at a given temperature is limited as it can only increase until the atmosphere becomes saturated whereupon it forms clouds and falls as rain or snow. The uncertainty about the effects of water arises because, although higher temperatures lead to more water in the atmosphere, the extent of cloud formation is difficult to predict. If the water stays as a vapour, it blocks heat radiation into space because it is opaque to certain infra-red wavelengths. On the other hand, if it forms clouds, these have a net cooling effect because their whiteness reflects more heat back into space during the day than they prevent escaping by acting as a warming blanket at night. Cloud formation may be a rather complicated process. Recent work has indicated that the bacterium Pseudomonas floating in the atmosphere can seed ice crystal formation and in so doing may play an important in forming the low-level cloud that is particularly effective in keeping the Earth cool by reflecting solar radiation. As the bacterium grows on the leaves of trees and is blown into the atmosphere from them, the planting of forests could have a much greater effect on the Earth’s temperature than the amount of carbon they extract from the atmosphere would indicate. So this is a feedback we might be able to usefully exploit. In addition, minute single-celled plants (phytoplankton) growing in the top layer of the sea may also have an important effect on cloud formation, in this case by producing a chemical called DSP . The DSP breaks down to DMS which is released to the atmosphere where it breaks down further yielding sulphur dioxide. This joins that produced by volcanoes and the burning of sulphur-containing coal and oil. The sulphur dioxide gives rise to sulphate aerosols encouraging the formation of the water droplets which form clouds. Thus maintaining the production of marine phytoplankton or even enhancing it may help to combat global warming. For the moment, however, if we leave water vapour, possible changes in solar activity and an increase in the cooling effect due to sulphate aerosols out of consideration, CO2 was responsible for some 48% of the warming that has happened since 1750 as Table 1 shows. But estimates from the Woods Hole Research Center in Table 2 show that during the 1990s, about a quarter of the CO2 released came from deforestation and land use change such as the ploughing of grasslands. Only rough figures are available for the tonnage of carbon released into the atmosphere and even less reliable estimates can be given for where that carbon goes. Some researchers refer to a “missing sink” because of their ignorance about where perhaps a third of the emitted carbon actually ends up. They suspect that it is being taken up by plants and soils but this has not been verified. Source: Woods Hole Research Center, http://www.whrc.org/carbon/index.htm and CCSN. This means that CO2 from fuel use contributed about 50% to the warming effect during that decade. This was more than any other single source. However, since the runners-up also contribute substantially – methane with approximately 4%, nitrous oxide 6%, CO2 from deforestation and land use change about 10% and halocarbons about 10% – it is clear that, although action is necessary to reduce the rate at which CO2 from fossil fuel use is being added to the atmosphere, these smaller emissions sources must be dealt with as well and need their own reduction programmes. Black carbon formed by the incomplete combustion of fossil fuels, biofuel, and biomass is of particular importance in this respect. Although it contributed about 13% of the warming effect in both 1750-2005 and 1990-2005 periods (see Table 1), it had the third largest heating effect in the former period but was second largest in the latter. This change in ranking resulted from the negligible overall change from 1990-2005 in atmospheric methane concentrations both in total atmospheric column, and surface measurements. This analysis should not encourage complacency about methane as surface atmospheric concentrations have started to increase again from about 2007. 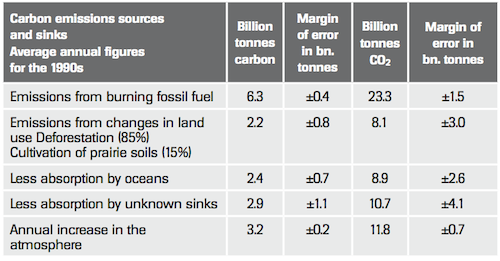 But the importance of black carbon may be even greater than implied by the figures in Table 1. 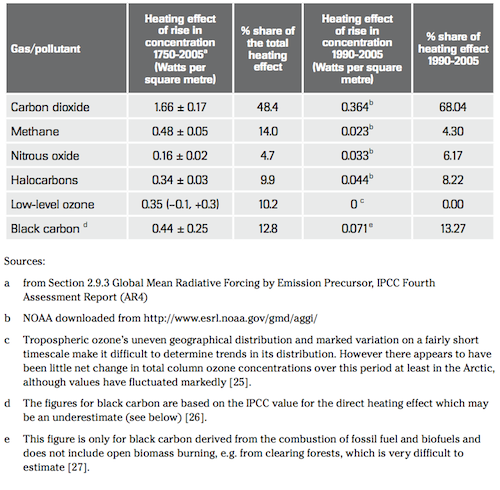 This is because the figures here are based on the IPCC AR4 value of 0.34 W/m2 for the direct heating effect (globally averaged direct radiative forcing) of black carbon. This may be a considerable underestimate; the IPCC’s value is much smaller than the 0.58 W/m2 obtained by averaging the values from the seven most recent studies which in the highest case calculated that the value could be as much as 1.0 W/m2. The worryingly rapid rise in temperatures since 1980 shown in Graph 1 indicates that the collective warming effect of all the atmospheric constituents is already too great. Although two Carnegie Institute researchers, Long Cao and Ken Caldeira, have calculated that for every 100 billion tons of carbon removed from the atmosphere, average global temperatures would drop 0.16°C, no-one knows with any certainty how much CO2 needs to be removed and sequestered safely away before warming stops. Indeed, that question cannot be answered at all. This is not just because of the level of scientific uncertainty but also because reductions in the other gases’ concentrations would mean that less CO2 would need to be removed from the atmosphere. The leading American climate scientist, James Hansen sees 350 as an interim goal to be re-assessed in the light of new data. He thinks it may not be enough because the melting of the Arctic sea-ice began in the 1970s before the 350 level was reached and suggests that 300-325 ppm might be necessary to maintain the ice. Professor John Schellnhuber, the director of the Potsdam Institute for Climate Impact Research in Germany, thinks that almost any concentration above the pre-industrial level of 270 ppm might be too much. He told The Guardian in 2008 that even a small increase in temperature could trigger several climatic tipping points. To return to the 350 level would require the sequestration from the atmosphere of a quantity of CO2 equal to all that added as a result of human activity since the 350 level was passed in 1987 together with all the CO2 that will be released before all fossil fuel use stops. Some, perhaps all of the CO2 that has been absorbed by the sea since 1987 will need to be recovered too because it will be released again as the atmospheric concentration falls. However, this “out-gassing” will take place relatively slowly and Long Cao and Ken Caldeira estimate that its recovery could be spread over 80 years. Certainly, the sea should no longer be regarded as an acceptable sink for CO2 emissions as the acidity of its water is rising in step with the amount of CO2 it contains and this is threatening animals and phytoplankton with calcium carbonate shells or skeletons. These make up more than a third of all marine life. Core samples taken from coral reefs show a steady drop in calcification over the last 20 years and it is feared that if CO2 levels in the atmosphere were to reach about 500 parts per million, the resulting rise in the seawater concentration would cause calcification to cease. The recognition that all future fossil fuel carbon dioxide released to the atmosphere from now on and almost all CO2 emissions for perhaps the past three or four decades will have to be recovered would have a significant bearing on the Trust’s decision on how rapidly fossil fuel use needs to be phased out. There would be no clear-cut scientific basis for this decision. Those taking it would have to base it on an assessment of how big a reduction can be made in the warming effects of the other gases and of how rapidly the land can be turned from an emissions source to an emissions sink as its plants and soils begin to sequester some of the unwanted CO2 from the air. Not only does CO2 have to be removed from the atmosphere but efforts should be made to remove other gases with long atmospheric life-spans – nitrous oxide and the halocarbons – as rapidly as possible so that the rate at which the world is warming actually slows. “Cutting HFCs, black carbon, tropospheric ozone and methane can buy us about 40 years before we approach the dangerous threshold of 2°C warming.” So said Veerabhadran Ramanathan, a distinguished professor of climate and atmospheric sciences at the Scripps Institution of Oceanography, San Diego, in October 2009 at the launch of a paper he co-wrote with Nobel Laureate Mario Molina and others. “If we reduce black carbon emissions worldwide by 50 percent by fully deploying all available emissions-control technologies, we could delay the warming effects of CO2 by one to two decades and at the same time greatly improve the health of those living in heavily-polluted regions” he added. The paper identifies four “fast-action regulatory strategies” which the authors think could take effect “within 2–3 years and be substantially implemented within 5–10 years, with the goal of producing desired climate response within decades.” Besides reducing black carbon, they propose running down the production of hydrofluorocarbons with a high global warming potential, accelerating the phase-out of hydrochlorofluorocarbons and recovering and destroying stratospheric ozone-depleting substances from scrapped products such as refrigerators. However any cooling directly caused by scrapping these powerful greenhouse gases may be at least partially compensated by warming produced by consequent increases in atmospheric ozone, itself a powerful greenhouse gas. Their third proposal is to reduce emissions of pollutants such as carbon monoxide, the nitrogen oxides, methane and volatile organic compounds. These undergo complex photochemical reactions and form ozone in the troposphere which extends up to 15 km above the ground. The paper says that this tropospheric ozone has increased by 30% since pre-industrial times and its contribution to global warming since preindustrial times is as much as 20% of that due to CO2, in agreement with the values shown in Table 1. In addition, although tropospheric ozone helps to prevent certain forms of skin cancer by absorbing UV radiation, the effect of ground level ozone on human health is strongly negative and in addition, as a 2008 Royal Society report showed, could have caused $26 billion worth of damage to crops in 2000. Reducing ground level ozone by half could delay rising temperatures by another decade, Professor Ramanathan says. The fourth proposal is to increase the sequestration of CO2 already in the air through improved forest protection and biochar production. Biochar is charcoal produced from biomass which is ploughed into the soil to retain nutrients, cut the release of methane and nitrous oxide, and increase fertility. Moreover, by encouraging the development of fungi and micro-organisms, it increases the soil’s carbon content by much more than its own weight. The paper cites a study by Lenton and Vaughan which suggests that, under highly optimistic scenarios, the capture of atmospheric CO2 by plants grown to provide bio-energy followed by capturing and storing the carbon they release when burned combined with afforestation and biochar production may have the potential to remove 100 ppm of CO2 from the atmosphere. This, alone, would return the atmospheric concentration of CO2 to near preindustrial levels and reduce the heating effect by 1.3 watts per square metre. “However,” the paper says in major understatement, “this may conflict with food production and ecosystem protection”. Full implementation of the identified measures would reduce future global warming by 0.5 ̊C (within a range of 0.2–0.7 ̊C.) If the measures were to be implemented by 2030, they could halve the potential increase in global temperature projected for 2050. The rate of regional temperature increase would also be reduced. This analysis leads me to think that while the climate crisis is alarming it is by no means hopeless provided we break down the problem and the solutions into their component parts and tackle the easiest, rather than the toughest, first. That can buy valuable time. So my suggestions for fellow climate campaigners are as follows. Stop being negative. Fossil fuel use may start declining quite soon anyway, climate deal or no climate deal. Talk about the advantages of investing in non-carbon energy sources sooner rather than later, because the energy required for the switch will never be as cheap again in terms of what has to be given up to get it. Insist on the highest environmental standards and compensation arrangements being put into place before any further shale gas or underground coal gasification licences are issued. This might be a more productive approach than fighting for an outright ban. Campaign for a set of international arrangements that recognises that fossil fuel CO2 is not the only problem and that a range of programmes is needed to tackle all the causes of warming, even the minor ones. As the safe level of greenhouse gases in the atmosphere has already been passed, plants seem at present the only realistic way to extract the excess carbon from the air and sequester it in the soil. So work to prevent further forest loss and to protect the carbon in soils, mires and peat bogs. Advocate re-foresting vast areas, changing grazing methods and using biochar to speed the rate at which long-lived forms of soil carbon can build up. Giving indigenous people an incentive to maintain woodland and plant more trees for example by encouraging the development of high value sustainable woodland products such wild silk and honey could help. Millions of people will need to be involved in this effort but increased rural prosperity should result. Moreover the spin-off from new forests could be more abundant water supplies and slower warming as a result of increased cloud cover. Talk about the health gains that would come from reducing black carbon emissions and dealing with low-level ozone. Of the rural prosperity that should come from increasing the soil’s carbon content and thus its fertility through better farming methods. Of the new, local industries than will spring up making plastics and other organic chemicals out of biomass rather than oil. Work to convince people that the global economy will never run properly again unless the benefits of using all scarce resources are fairly shared. Support the setting up of a Global Climate Trust so that the scarcity rent from fossil fuel use gets properly allocated. Leaving the effects of climate change aside, the main danger that humanity faces is that it will not invest enough of the fossil energy it can extract with a reasonable net-energy gain into making the transition to renewable energy sources. Every post-credit-crunch year that the global economy stays stalled with its engine idling and burning fuel leaves less in the tank to get it anywhere once the clutch is depressed, the gears engaged and a definite direction taken. Future generations will be hungrier, poorer and probably much smaller because of the delay. Now, for the first time, if we can get people to internalise the implications of oil peak and the other resource constraints, we have a chance to go beyond Lord Stern’s mildly-negative position that the cost of dealing with climate change is not very high and move on to the positive position that no costs, and no self-denial are involved. Instead, rationing energy use in order to share out its benefits is essential for the proper working of the economic system and will create millions of jobs and commercial opportunities now. In particular, campaigners should refute the uber-negative position adopted by Clive Hamilton in his 2010 book Requiem for a Species that it is now too late to do anything about the climate except to resign ourselves and die with dignity. The main reason Hamilton thinks this is the case is that he believes that the institutions and thought processes which would need to change to make a better outcome possible will not do so in time to save the day. If, as he assumes, economic growth was still possible, he might be right. The promise of higher incomes for the next few years would almost certainly continue to place an effective block on proposals to cut fossil fuel use, and thus incomes, now. But that block is cleared away by the recognition that regulating fuel demand means much higher incomes in the medium to long term than those that would result if a market-free-for-all led to an economic collapse. Environment and business can walk hand-in-hand and once the limits to the fossil energy supply and thus to economic growth are recognised their interests become aligned. 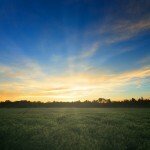 So there are strong grounds for believing that the climate crisis can be overcome and that many people’s lives, particularly in the poorer countries, could be materially better than they are now because of the work the production of biofuels and biochemicals to replace their fossil equivalents should bring, coupled with the additional fertility that biochar should create. Since the alternative is industrial and societal decline and, after increasing unrest, an eventual collapse, there’s every reason to think the system will incline the right way. But one thing is necessary first: the twin myths that there’s plenty of energy and that economic growth can continue must be exposed. If climate campaigners can get that message over, their battle would be as good as won. 6. Zero Carbon Britain (2007) ZeroCarbonBritain: an alternative energy strategy, Machynlleth: Centre for Alternative Technology. 17. Private conversation, 9 September, 2010, with the Irish energy minister, Eamon Ryan, who attended the meeting. 21. It will not be possible to use the fossil CO2 emissions permits to cover these emissions as, if there was a net loss of biomass and soil carbon in any year, the use of fossil permits to cover its release would mean that there was an inadequate number of permits left for the purchase of that year’s capped amount of fossil fuel. If the fossil fuel producers had agreed to participate in the capping scheme on the basis that their annual sales and the income from them were guaranteed, as seems likely, the failure to purchase all their fuel would be in breach of the Trust’s agreement with them. 23. Ekstrom, S. et al., (2010) “A possible role of ground-based microorganisms on cloud formation in the atmosphere”, Biogeosciences, 7, 387–394, 2010 http://www.biogeosciences. net/7/387/2010/bg-7-387-2010.pdf. 25. Ravishankara, A.R., M.J. Kurylo, and A.-M. Schmoltner, (2008):.”Introduction”, In: Trends in Emissions of Ozone-Depleting Substances, Ozone Layer Recovery, and Implications for Ultraviolet Radiation Exposure, NOAA; downloaded from http://www.climatescience.gov/ Library/sap/sap2-4/final-report/#finalreport. See also V.E. Fioletov (2008): Ozone climatology, trends, and substances that control ozone, Atmosphere-Ocean,46:1, 39-67 which may be purchased from http://www.tandfonline.com/doi/abs/10.3137/ao.460103?journalCode=tato20.